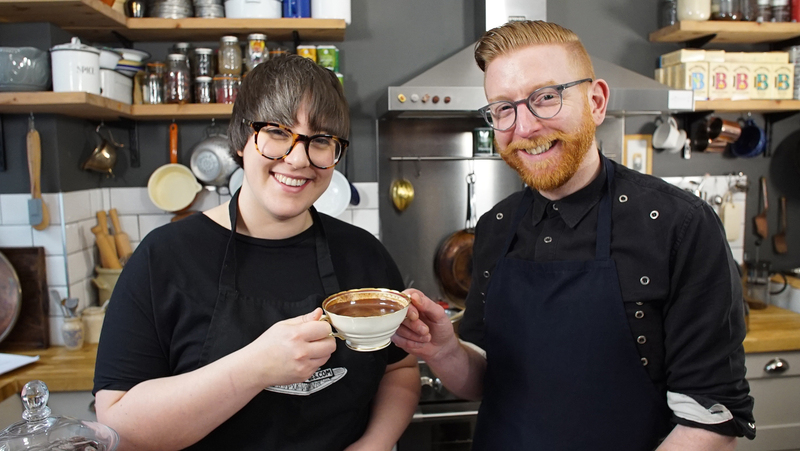 Food historian Tasha Marks explores the chocolate heyday of London and recreates Sir Hans Sloane's hot chocolate recipe as part of our Pleasant vices series. Tasha Marks and Paul Young. When we think of chocolate, we tend to imagine it in its solid bar form. However, eating chocolate was not in regular production until the mid 19th century (following the invention of Conrad Van Houten’s screw press in 1828). Chocolate was introduced to England around 1600, first and foremost as a drink, and remained popular in that form for over 200 years. The 18th century was hot chocolate’s heyday. The chocolate makers were intertwined with London’s infamous coffeehouse culture, where the beverages were a catalyst for culture, politics and passions. At the coffeehouse you could get a fortifying hot drink, whether that be tea, coffee or chocolate, over which the day’s events and possibilities would be played out. 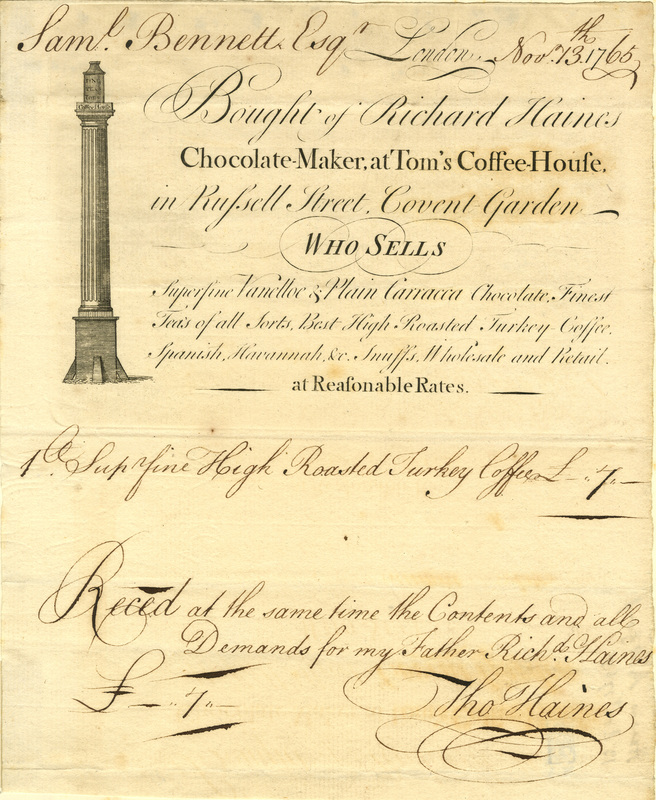 Trade card of Richard Haines, chocolate and cocoa dealer, 1765. 18th-century hot chocolate was more bitter than our modern variations, but still intensely pleasant. Initially made with cocoa liquor (blocks of ground cocoa nibs) and water, it was popularly served with an equal mix of water and milk, spiced with ingredients including cinnamon, sugar, vanilla, chilli, rosewater, honey, pepper, jasmine or even ambergris. 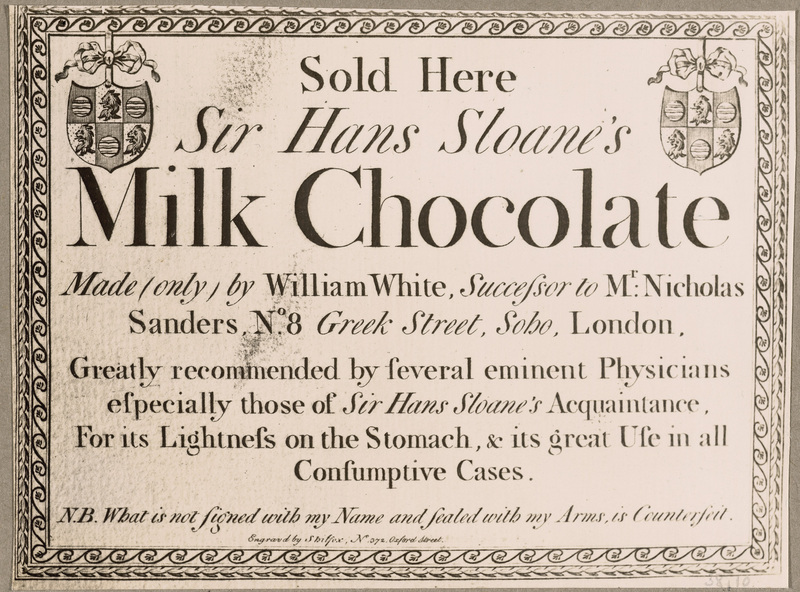 Sir Hans Sloane, whose vast collection of objects became the founding collection of the British Museum, is believed to have been the first to combine milk with chocolate – though this is hotly debated. 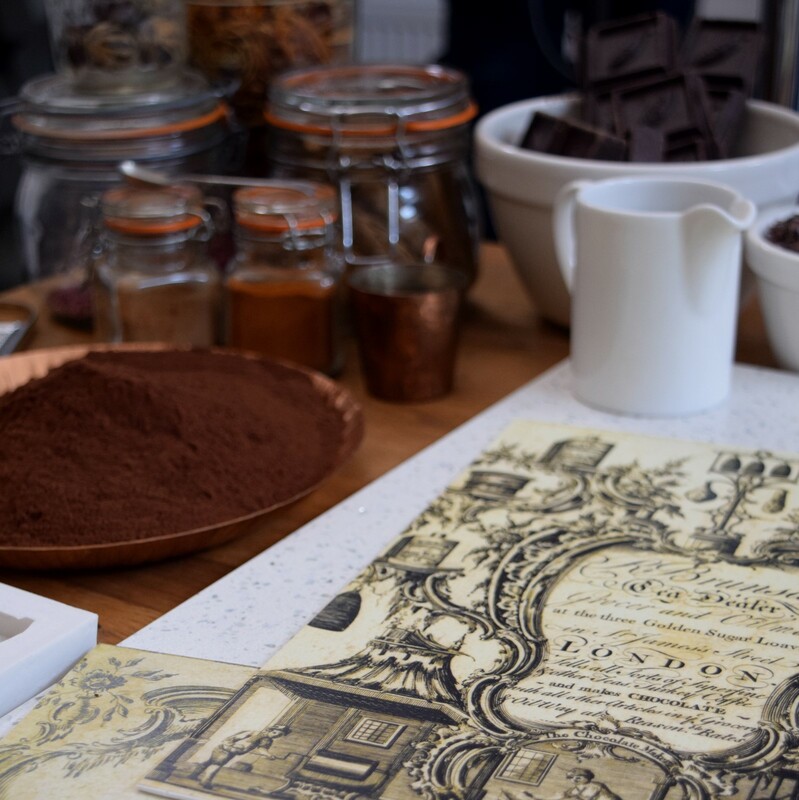 What is certain is that Sloane’s name became synonymous with chocolate in the 18th century, with ‘Sir Hans Sloane’s Milk Chocolate’ being a badge of honour for any chocolate dealer. Trade card of Edward & John White ‘the only makers of Sir Hans Sloane’s Milk Chocolate’, around 1810. Sloane developed an interest in the medicinal properties of chocolate while in Jamaica working as a physician in the 1680s, where he thought it a natural aid to digestion. 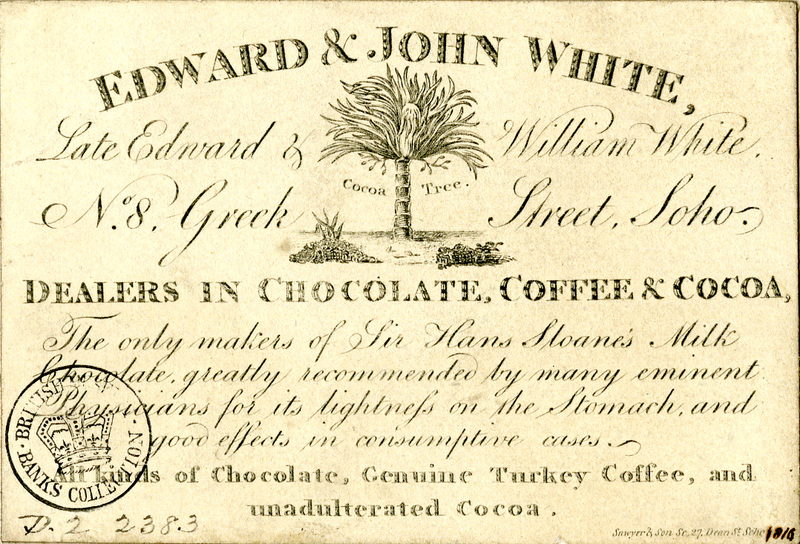 As seen in this trade card for William White (below), the medicinal properties of chocolate were key to its marketing jargon, alongside Sloane’s seal of approval. Not that I personally need much convincing, nor did the 18th-century public. These days the chocolate craze shows no sign of abiding, with the average UK resident found to have consumed over 8kg of chocolate in 2017. Sir Hans Sloane would be proud. Trade card of William White, chocolate and cocoa dealer, around 1800. Finely chop the plain chocolate and put to one side. To a saucepan add the milk, honey, vanilla, cinnamon and chillies. Bring to the boil, then turn off and leave for 5 minutes to infuse. Remove the cinnamon, vanilla and chilli from the milk mixture. While the milk is still warm, add the chocolate and whisk heavily until the chocolate is dissolved and there is froth on top. Serve in a wide-bottomed cup and enjoy! With thanks to Paul A Young, master chocolatier. Join Tasha, Paul and other guests from our Pleasant vices series at a special panel discussion on Friday 25 May to discover more delectable treats inspired by history and the Museum’s collection.